Do People Regret Expensive Tech Purchases? Do Americans ever regret shelling out cash for the latest tech devices? We discover which purchases are truly splurge-worthy, and which ones are most regrettable. At a time when people increasingly favor spending money on experiences rather than material possessions, and the prices of certain big-ticket items like televisions and international airfare are falling, what do most Americans think is worth splurging on anymore? While the price on some purchases may be going down, smartphones are now getting more expensive after years of lower prices. With the cost of some devices eclipsing $1,000, do people ever regret having the newest Samsung or Apple device after shelling out heaps of cash to upgrade from their old phones? To find out, we surveyed 998 Americans on which purchases mattered most to each generation, if millennials spent as much on experiences as they seemed to value them, and which purchases people generally regretted buying the most. Read on to see what we discovered. Whether you've researched a product well enough to make an informed decision or purchased something on a whim, it's entirely possible to feel buyer's remorse almost immediately afterward. Nearly half of Americans regretted buying their homes after the paperwork was signed – but what about smaller, everyday purchases? As we explain later, Gen Xers spent the most on TVs, but baby boomers were the most likely to feel regret over buying them. And when it came to the newest trend in wearable technology, Gen Xers weren't alone in second-guessing their buying decision. More than 54 percent of baby boomers and 43 percent of millennials joined the 48 percent of Gen Xers experiencing regret over purchasing smartwatches. Despite the rave reviews Amazon received for a recent Alexa ad, smart speakers were also among the most regretted tech buys across the generations. According to our survey, the “experiences over things” sentiment doesn't necessarily apply only to millennials. Americans were less likely to feel remorse on experiential purchases, especially when it came to family celebrations like birthdays. Roughly 12 percent of millennials and baby boomers had regret about money spent on a family occasion. Overall, Americans of all ages felt less regret about money spent on experiences than tech. Still, nearly 19 percent of millennials felt remorse about spending on experiences, compared to roughly 32 percent who regretted spending on tech. Every year, the battle between Apple and Android seems to get stronger and stronger. While people are constantly stacking the two against each other to determine which brand really produces a superior product, we wanted to know how men and women felt about their phones once the money had been spent. 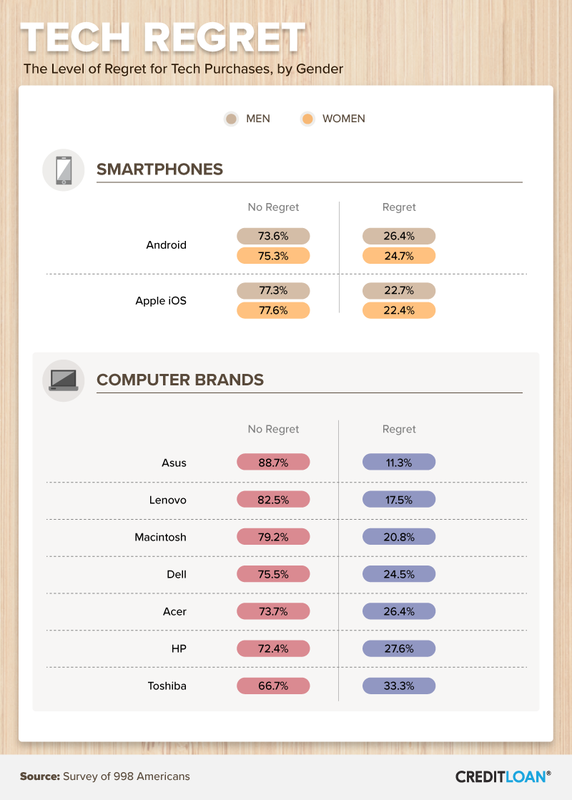 Over 26 percent of men and nearly 25 percent of women who purchased an Android regretted the investment. That's slightly higher than the percentage of men and women who chose team iPhone. 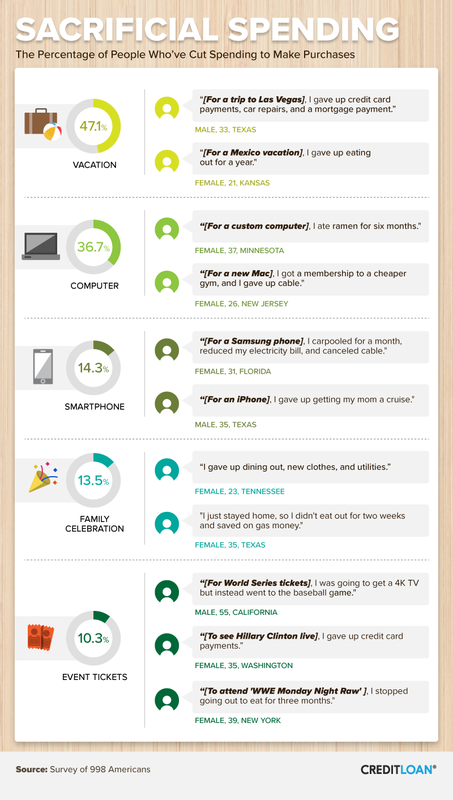 In general, both men and women who purchased an iPhone were happier with their purchase. And what about personal computers? With overall prices on the rise, knowing which brand to invest in for long-term satisfaction can be trickier than just reading the price tag. Our analysis revealed Asus computers (which some experts rank among Apple and Dell as the best on the market) earned the highest rating from Americans polled. While Toshiba may be a well-known brand, 1 in 3 experienced regret after purchasing a desktop or laptop computer. While some brands may offer a better value in the eyes of consumers polled, experts suggest electronics should always be purchased with a credit card to maximize rewards and potential extended warranties. Studies suggest millennials above any other generation value experiences like vacations, concerts, and sporting events over material possessions. According to our research, millennials reported valuing these experiences higher than Americans in other age groups but admitted to spending the least on both technology and experiential purchases overall. Our survey also revealed men and women of every generation placed a lower valuation than experiences on technology purchases (including tablets, TVs, and smartwatches) but spent more, on average, than they felt those products were worth. While the average estimated values on technology purchases ranged from $284 to $292, Americans were willing to spend $70 more than they thought those products were worth in some cases. Millennials especially spent more on smartwatches and smart speakers than any other generation. Unlike technology, Americans actually valued experiences higher than the amount of money they spent on them most recently. 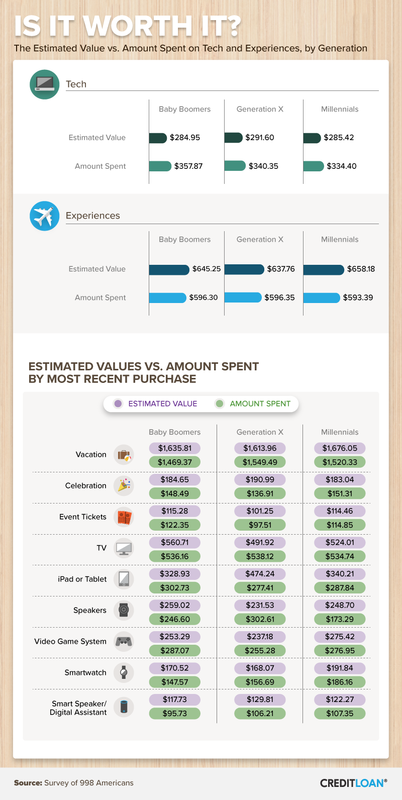 With their estimated worth ranging from $637 to $658 across all generations, respondents told us they only spent, on average, between $593 and $597 on vacations, celebrations, or events like concerts. For vacations specifically, millennials put the highest value on their leisurely adventures, while Gen Xers were willing to spend the most to get away. In either case, understanding how to maximize your spending (and earn rewards) with the right travel credit cards could help lower out-of-pocket expenses that come with jet-setting. Considering the hundreds (and sometimes thousands) of dollars Americans told us they spent on average for vacations, tech splurges, and more, we asked them to identify how often they made sacrifices on other purchases to help fund things that mattered more. Over 47 percent of people admitted to forgoing less exciting expenses to help fund their vacations. One man told us he gave up “credit card payments, car repairs, and a mortgage payment” to afford a trip to Las Vegas, while another woman said she “gave up eating out for a year” to fund a Mexico vacation. Research shows Americans spend 10 percent of their annual income on vacations, and many don't budget for additional expenses after arriving at their destinations. More than 1 in 3 people made sacrifices to afford a new computer, and over 14 percent of men and women admitted giving up other expenses to buy a new smartphone. One man even told us he gave up trying to send his mother on a cruise vacation to buy a new iPhone instead. While Americans may value experiences over any other purchase, they aren't spending as much on them as they might be worth. Some people may even be implementing dangerous habits to afford their travel plans –including avoiding bills and other debts. And while electronics purchases weren't valued nearly as high, people of every age were more likely to overspend on those purchases and even occasionally regret the splurge. At CreditLoan.com, we're here to support every aspect of your financial journey – from providing the recommendations on the best in credit cards and personal loans to credit monitoring and debt consolidation. Whether you're trying to build a better budget for your family so you can spend responsibly without regret or are thinking ahead toward retirement, CreditLoan is here for you. We collected responses from 998 Americans using Amazon's Mechanical Turk service. 52.6 percent of our participants identified as female and 47.2 percent as male. Less than 1 percent identified as another gender. Baby boomers accounted for 10.1 percent of participants, 26.4 percent belonged to Generation X, and 62.1 percent were millennials. The remaining 1.4 percent of respondents belonged to other generations. Participants ranged in age from 18 to 74, with a mean of 35.8 and a standard deviation of 10.9. We excluded two participants whose responses were incomplete or inconsistent. We weighted the data to the 2010 U.S. census for age and gender. We omitted computer brands and smartphone providers from comparison that had fewer than 26 respondents. We did not have a validated measure of regret level available to us, so we created one. This was based on a 5-point Likert-type scale. We asked respondents to rate the extent in which they regretted their most recent purchases on a scale from 1 to 5, where 1 equated to “Not at all,” 2 was “A little,” 3 meant “Somewhat regretful,” 4 equalled “Moderately,” and 5 represented “A great deal.” Responses of 2 and 3, as well as 4 and 5, were grouped for simplicity when presenting our findings. Want to share our findings? Do it with no regrets, as long as it's for noncommercial purposes and you link back to this page and provide proper credit to the author.